Univ.-Prof. Helmut Zehetner, vice-president of the famous Vienna Philharmonic Orchestra and the president of the Artistic Committee of the World Orchestra Festival. In 2015 the "One Future - The World Orchestra Festival" celebrated its 3rd anniversary. 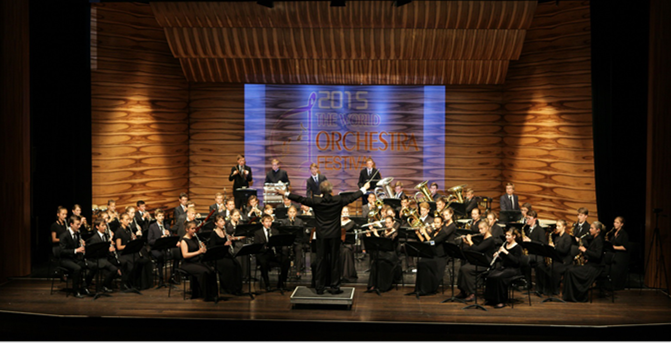 More than 350 young musicians have participated in the 2015 World Orchestra Festival. 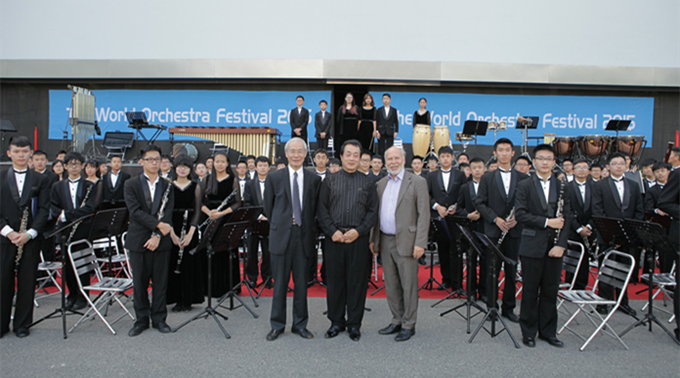 The orchestras participating at the 2015 World Orchestra Festival came from Austria, China, Singapore and Latvia. The Plaza of the famous Vienna City Hall, the Vienna Boys Choir Concert Hall MuTh, the University of Music and Performing Arts in Vienna and the Golden Hall of the Vienna Musikverein etc. have served as venues for the 2015 World Orchestra Festival. Music is the universal language, which connects us and opens our hearts, no matter which cultural background we have. 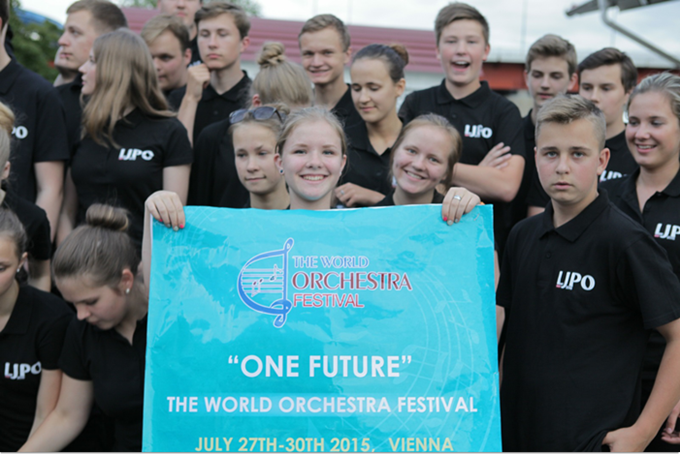 From July 27th till 30th 2015, "One Future - The World Orchestra Festival" took place again in Vienna for a 3rd time. The music capital of world was the stage of more than 350 young musicians from Austria, China, Singapore, Latvia etc. The Festival provided a communication platform for the young generation to perform, to compete, to communicate, to establish and deepen friendships, regardless of the participants' origin. In the afternoon of July 27th, the opening ceremony was held in front of the famous Vienna City Hall. The young musicians were received by Marianne Klicka - Third Vice-President of the Parliament of Vienna, Prof. Bian Zushan - a renowned Chinese conductor in orchestral music and education and Prof. Herbert Klinger - Artistic director of the Vienna Police Band. The representatives from politics, music education and universities held inspiring opening speeches. Orchestras from different countries participated in the Festival e.g. symphonic orchestras: Latvia Youth Symphonic Band, Shenzhen Middle School Symphonic Orchestra, China Hubei Yichang Jindongfang Middle School Symphonic Orchestra; string orchestras: Kids' Philharmonic @ sg; brass band: The Music Corps of the LAZARUS UNION, The Marching Band of Wujiashan No.3 Middle School, No.1 Primary School in Donghu District of Wuhan, China Star of Golden Bell Orchestra from Zhengzhou No. 2 Middle School; percussion ensemble: The Ethnic Marching Band of Sunshine Middle School of Xi'an Jiaotong University, etc. On the July 30th, the highlight of the third "One Future - The World Orchestra Festival" was the Gala Concert at the famous Golden Hall of the Vienna Musikverein where the famous New Year's Concert of the Vienna Philharmonic Orchestra takes place every year. All the participating orchestras presented a passionate performance and an elegant visual show to the attending audience in one of the world's top art palaces. The excellent orchestras were given the prizes by the Festival Artistic Committee. 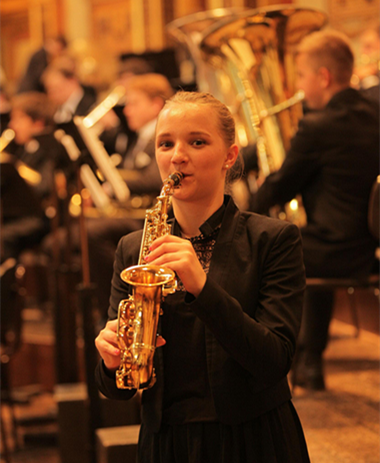 At the end of the festival, the Latvia Youth Symphonic Band played the famous song "Y. M. C. A. ", which brought the concert to a climax, inspiring the other orchestra members and the audience to applaud and to dance together. Smiling faces, excitement and nostalgia from everyone showed the success of the festival. 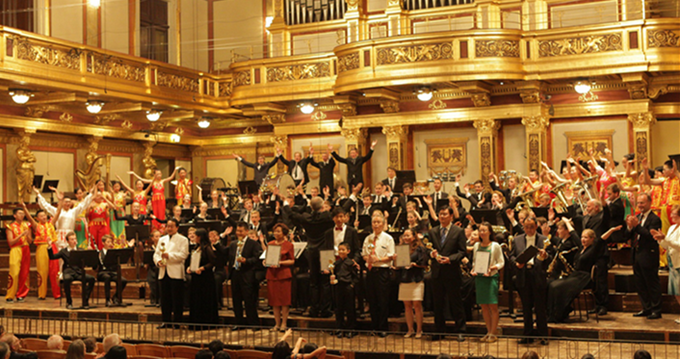 "Thank you for your effort in organizing the festival, our kids and conductors had a wonderful experience in Vienna. After the festival, the kids will have more enthusiasm in learning and playing music. They have learned a lot from the professors too." ------ Wang Kang, Kids' Philharmonic @ sg, Singapore. "Everything was perfect. It was very impressive!" One Future - The World Orchestra Festival welcomes you! Let`s show your music talents and spirit in Vienna in 2016! Special thanks go to the office of the Federal President of Austria, and The University of Music and Performing Arts in Vienna for their great support for "One future - the World Orchestra Festival".